The last time Fred Tomaselli had a solo show at James Cohan Gallery was in 2006. I vividly remember seeing those mind-blowing paintings that were enhanced with magazine and book cut-outs, pills and tree leaves creating intense collages that invited people to look at them for hours. 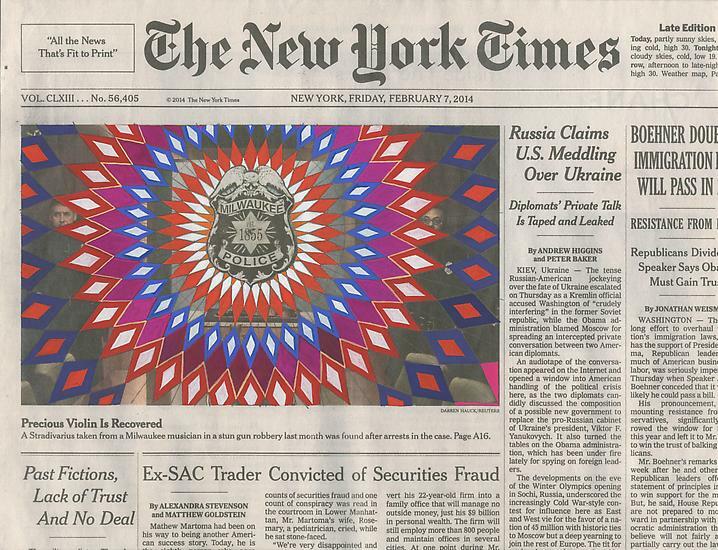 One of the New York Times "Collaborations" by Fred Tomaselli. This in particular is quite recent, from February 2014. I have been a fan of Tomaselli’s work for a long time, so obviously knowing that he is about to open a solo show at James Cohan on May 1st, I jumped at the opportunity of visiting his studio and having a preview of some of the pieces that will be exhibited. All of Fred’s works have to do with his own perception of reality filtered through the lens of his life including nature observation, gardening, bird watching, fly-fishing and yes, current events. Tomaselli has formed a strong relationship throughout the years with The New York Times. He has been a subscriber of the newspaper for decades and in 2005 he got completely mesmerized by the photo on the front page: Bernie Ebbers, the just convicted chairman of the defunct WorldComm, had fallen from grace in the eyes of world, and to top it all off, with an infamous image on the cover page of The New York Times. This was the starting point for a series of “collaborations” where Tomaselli, being artist, archivist and a preternaturally curious human being added his own drawing on top of the original newspaper and addressed that specific image in a way that felt right to him. Nine years and close to 90 of these New York Times “collaborations” later, Fred has formed his own dialogue with arguably the most important and relevant newspaper in the world. We discuss in particular whether this is still the case and we both agree it is the most important newspaper in the world. Tomaselli shows respect and deference for the actual profession of paid journalism although we both know that the subjectivity of writers and editors doesn’t give us the unadulterated truth all the time. He also tells me: “that type of media where everyone is writing and posting articles for free, that is not good, it cannot be and it is actually very dangerous for democracy”. I’m still thinking how I feel about that. A New York Times piece in progress. Some of the New York Times "collaborations" flank a large painting that also will be at the show. The selection of the images that will actually become a collage and a part of The New York Times series happens after Tomaselli studies some of the front pages for a while (he has been archiving all of them since 2005) and revisits them a few times until he feels that they have what it takes to become true art. Fred and I discuss art, news, media and current events. His studio has a ping-pong table. I love it. 18 of the Times’ collages that include a sample of images that could be defined as apocalyptic, moving, dramatic, shocking and compelling will make it to the show. Moreover, the entire series will be documented in a new book published by Prestel and called Fred Tomaselli: The Times. The New York Times series also will be the subject of a touring exhibition opening at the University of Michigan Art Museum next October 2014 and traveling on to the Orange County Museum of Art the following February. Fred and Lawrence Weschler (his co-author in this book) will be discussing the show and the book in a conversation at the New York Public Library on Wednesday May 28th. I even felt compelled to touch it. Gently, of course. Fred explains me this abstract piece - it actually blew my mind. His talent is infinite! Additionally, nine extraordinary new paintings will be part of Current Events. Consistent with the technique and composition that Tomaselli has been known for, the highly visual and incredibly charged paintings include real bugs and butterflies, plants, flowers, pills and cut-outs among many other things. These pieces, though, leave a lot more exposed, perhaps a reflection of a less guarded Fred, who doesn’t need to encase them in resin or cover them with a glass. The interaction with the onlookers is more vivid, the experience more real. My favorite is a large painting of a fish that seems to be either eating or vomiting the trash that he ingested while living in a polluted ocean -- it is called “Gyre” (completed in 2014) and refers to the North Pacific Gyre where garbage floats in the vortex. The piece deals with a lot of current issues that have to do with the environment, the politics of being “green” or “clean” (is it for real? are the governments really doing something?) and a myriad of other interpretations, all of them so attuned to our present-day affairs. In the end, this show comes full circle and so does my visit to Tomaselli’s studio. I dare anyone who’s looking not to get lost in these pieces and have something to say about these Current Events.